Every coach has been there. It’s time to take the field and players are yelling, “Where’s my glove?” Good coaches know that if you organize the dugout- game days just go smoother. The Dugout Manager makes it simple to organize the dugout. It takes a lot of time and energy to make sure your players are ready for the game. When it’s game time you don’t need the chaos of players searching for gear. Players that can’t find their gear can derail the team and waste valuable energy. You need a solution to the problem of managing the equipment in the dugout. 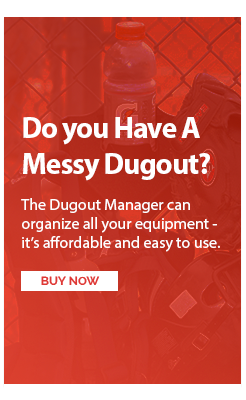 The Dugout Manager is an affordable solution. The dugout manager (DOM) securely organizes the equipment so players can focus on playing the game. No more hunting in the dirt for gear. The patented design utilizes off-set slots and an upside down v to make sure that drinks stay put instead of dumping all over the place. The DOM is not limited to only the six important pieces of equipment – it can also be used to hold a cap, towel, catchers gear, and more on the same hooks under the glove or helmet. Say goodbye to all that expensive equipment being kicked around or scattered all over the bench. Eliminate confusion during and after the game. Players will be focused on the game, and you can manage your team instead of the dugout. The DOM is a cost-effective way to make sure your equipment is ready to go when you are! Your time is valuable. Why waste it constantly clearing out pathways and searching through piles looking for misplaced equipment? Order the Dugout Manager and keep your team and your equipment organized and in the game!